NYIA/IAI has hired a private chartered bus to transport us round-trip between NYC and Roanoke for our 2019 Summer Retreat.. 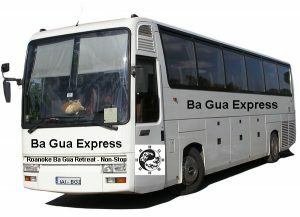 If you are coming from Europe, traveling through NYC, live in NYC or nearby, taking the IAI Ba Gua Xing Yi Bus is the most convenient way to travel! Plus, having the bus makes it easy for all of us to bring our Ba Gua and Xing Yi weapons. Date/Time: Bus will depart NYC Tuesday, July 23, 2019 early in the morning, and leave Roanoke around 1pm Sunday, July 28, arriving back in NYC Sunday evening. You can drive the 8-9 hours yourself or take a flight, but wouldn’t it be nicer to relax on a bus, chatting with you school brothers & sisters, taking a nap or watching a kung fu movie? Spaces are limited. Reserve your spot on the bus today! click the button below and pay via PayPal. Payments through PayPal, all major credit cards accepted. Please note: bus payment is non-refundable.